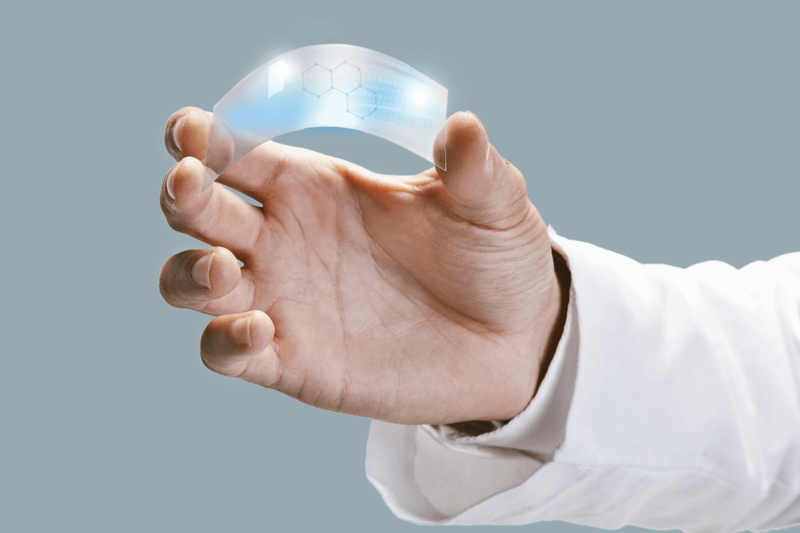 Graphene: from smartphone batteries, through artificial arms and legs to wearables. This material will be used to make lots of objects! Graphene is described by many as the material of the future. The substance that will forever change many of the devices we use every day as smartphones, robots and wearables. Its characteristics are unique: it is 200 times more resistant than steel and will allow the creation of long-lasting products. Furthermore, a graphene layer is lighter than a sheet of paper therefore it can be used in any device without weighing it down. Let’s talk about smartphones, wearables and smart home objects. Many of these devices will soon become objects that we will find on the market because, according to market experts, the introduction of graphene in devices such as PCs or phones will be the great innovation of the coming years. It is a material composed of a thin layer of “packed” carbon atoms in a honeycomb structure. Actually it comes from graphite, a process that scientists were able to develop only in 2004. Therefore from this process, realized for the first time in Europe thanks to the Graphene Flagship research program, a flexible, resistant and ultralight material was born. But on which devices will the “graphene revolution” have the greatest impact? Smartphones, as already mentioned, will probably be the devices most revolutionized by the mass use of graphene. For example, the folding screens of the phones of the coming years will be made entirely with graphene layers. In this way they will be able to bend without being damaged and will resist falls in a much more essential way than the current displays with a glass protection layer. But the real graphene revolution in the world of mobile telephony will come in the context of batteries. In fact, graphene batteries will allow us to use a device for several days, some scholars also hypothesize for weeks, without having to recharge. Actually, it accelerates the energy transfer between an energy source and the battery exponentially, compared to the current lithium batteries. This means that on average in seven seconds we could recharge our smartphone. Is it science fiction? According to Kari Hjelt, head of the Graphene Flagship program of the European Union, the first application in a mass telephone of a graphene battery will take place within a maximum of two years. Finally, it will also serve to improve 5G superfast connections. For example, some manufacturers have already tested the use of a 5G connection line made with the aid of antennas with graphene with excellent results. But that’s not all, because even the covers and the body of the phones could be coated in the future in such a way as to be comfortable, ergonomic, light but super resistant. Another field that will be revolutionized by its massive use is the world of robots, especially those used in the medical field. For example, in the biomedical it can be used to make artificial legs and arms much more resistant. In fact, by incorporating artificial nervous sensors, based on graphene layers in the amputated part of the limbs, a person is able to perceive and respond to contractions and other movements of the muscles. This application in the medical field will help in the future a person to control the movement and strength of a robotic limb with extreme precision, almost reaching the level of naturalness in the movement of an un amputated limb. Among the other great qualities of graphene, we find the ability to absorb light at almost every wavelength, and is able to detect ultraviolet and infrared rays. What does all this mean? It means that in the future we will see cameras, on smartphones or on wearables, made with graphene sensors that will be able to reveal details invisible to the human eye, such as distinguishing the difference between almond milk, animal milk and that of rice. An aspect that will greatly help people with food intolerances who will no longer eat the foods to which they are allergic. As it is flexible, it is ideal for wearable devices. For example, researchers from the Institute of Photonic Sciences in Spain, located in Castelldefels near Barcelona, ​​have integrated it into special UV patches that can be attached to the skin like any other normal patch. The graphene layer hidden inside the innovative patch is highly sensitive and can measure heart rate and oxygen in the blood. In addition to monitoring exposure to UV rays and suggesting when to shade or spread protective cream on our body to avoid sunstroke in summer. In practice this is a miniaturized system that can monitor our health.